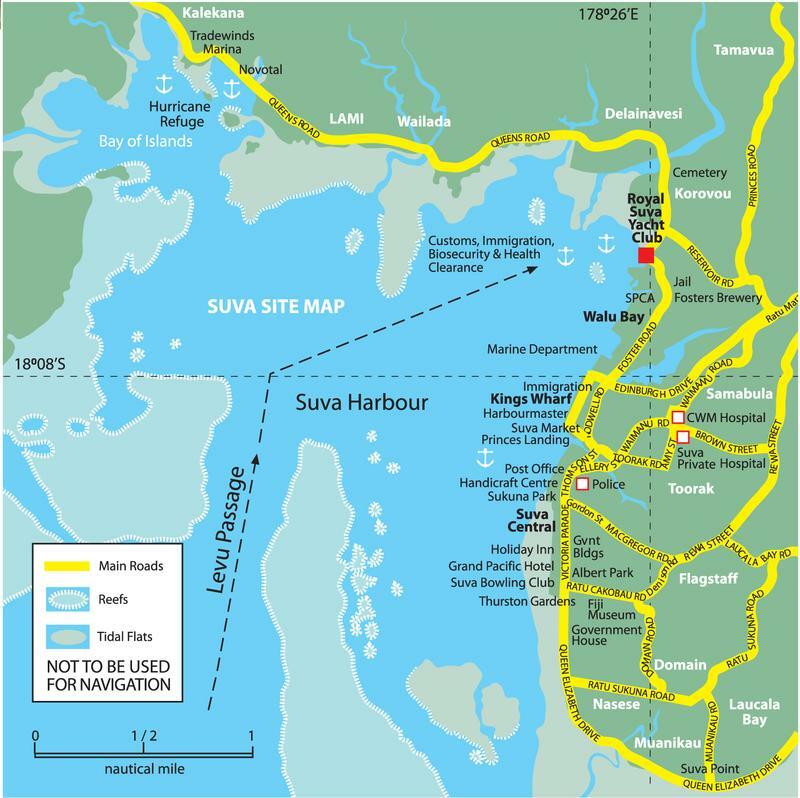 Anchorage in the Suva Harbour is shared by fishing boats, freighters, yachts, and cruise liners. 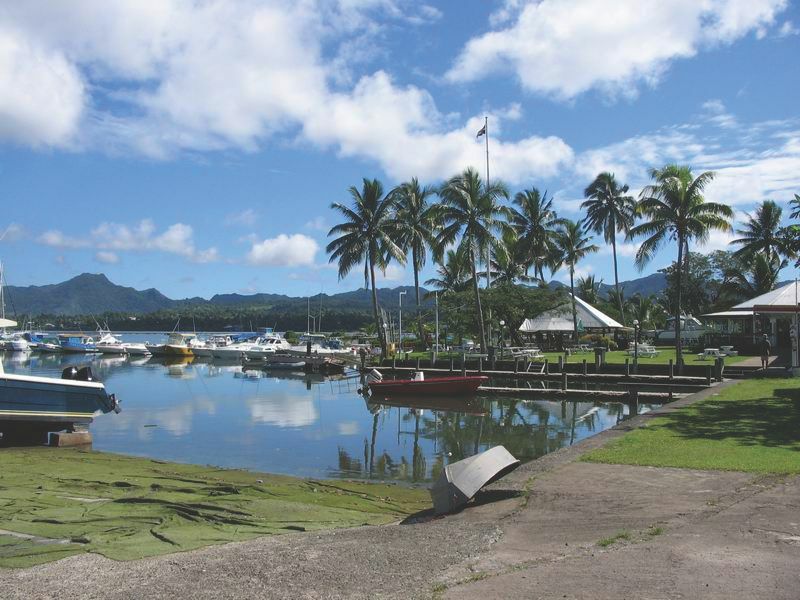 If you prefer to use a marina facility, the Royal Suva Yacht Club is the place to go. The club was founded around 1930 and while originally located closer to town, the current building in Walu Bay was built circa 1940. The rich history of the club can be found dotted around the clubhouse with trophies, photos and mementos on display. Coming ashore at the Royal Suva Yacht Club is convenient and hassle free as the club offers a comprehensive range of facilities to boat owners, plus social facilities for its associated members. 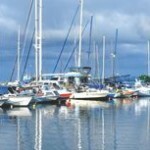 Overseas sailors can use the facilities for a small fee. 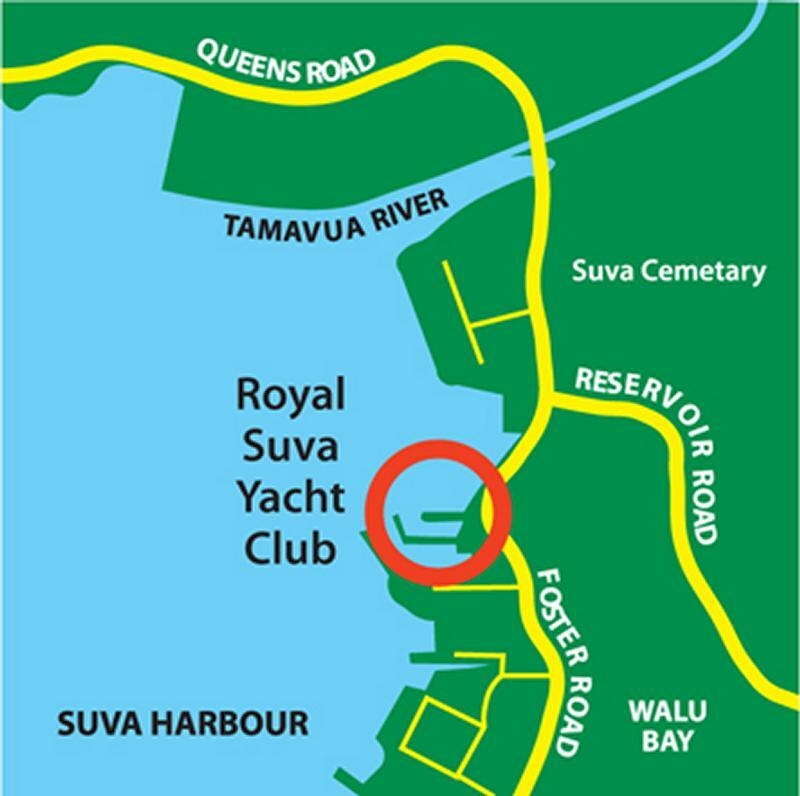 If you intend to use the Royal Suva Yacht Clubs facilities, you will need to register with the club and become a temporary member. 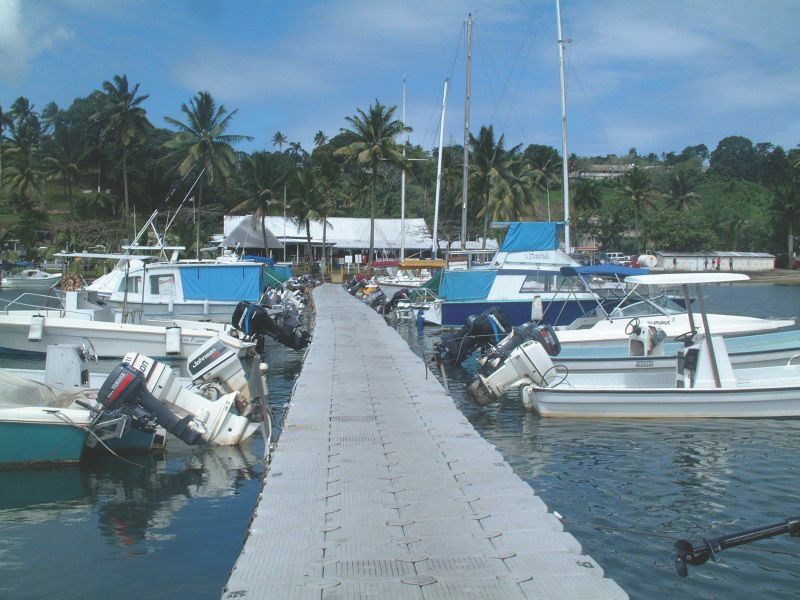 Trot and Plastic Pontoon moorings are generally leased out to members who own private vessels and are available on a first come, first served basis. There may be a wait list and notification will be given on the next available mooring upon registration of your vessel. 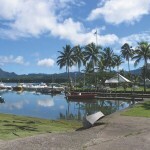 Concrete moorings are an extension to the plastic pontoon and are able to cater for bigger boats or visiting yachts. 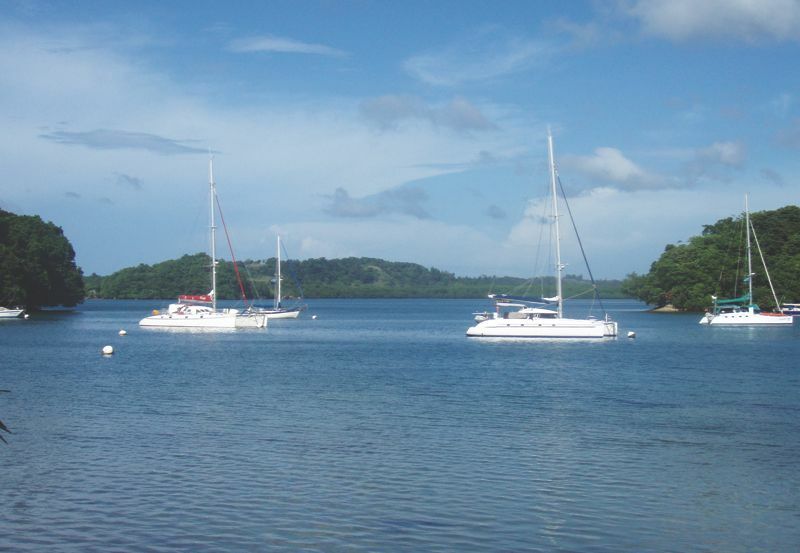 The concrete moorings are to facilitate visiting Yachtsmen and small Commercial Yachts/ vessels. 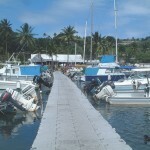 The Dinghy Docks are to temporarily facilitate members and offshore yachts dinghy for embarkation and loading purposes. 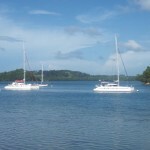 Prior arrangements with the administration office are to be made if you are planning on leaving your dinghy over night. 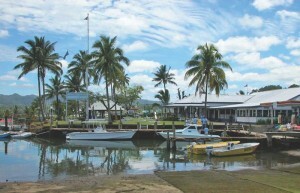 The trailer park area is facilitated as a hardstand for boats on trailers, which are leased out to members who prefer the trailer park to a mooring site. Every boat has to have it’s name clearly displayed so it is easy to identify in times of emergency. There is 24 hour security on site. The club has bathrooms with hot water, and a next day laundry service. There’s also a restaurant, a great kid’s playground and wireless internet access that may cover as far as some of the offshore moorings. 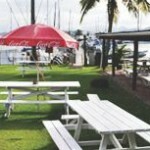 The Galley Restaurant is attached to the main clubhouse and offers casual or fine dining. Breakfast, lunch, dinner and a wide selection of bar snacks are available with last orders at 9pm. The restaurant is closed on Mondays. The Club’s Bar Complex is exclusively for members and their guests, registered guests to the club and reciprocal members who are 18 years of age and over. The bar offers snacks, (which can also be purchased from the restaurant), light music and television (including Sky TV for sports enthusiasts). The lounge area offers a more relaxed atmosphere away from the bar and provides television (inclusive of Sky TV) and a DVD Deck for movie lovers. The new Bure Bar & BBQ area is a popular spot set outside on the lawn, which provides some quiet shade from the main bar. It has become very popular with the 42” TV screen regularly screening sports events like Super Rugby. RSYC also has a projector and screen for larger than life coverage of major sporting events. A barbeque set is available for use in this area for a small fee. 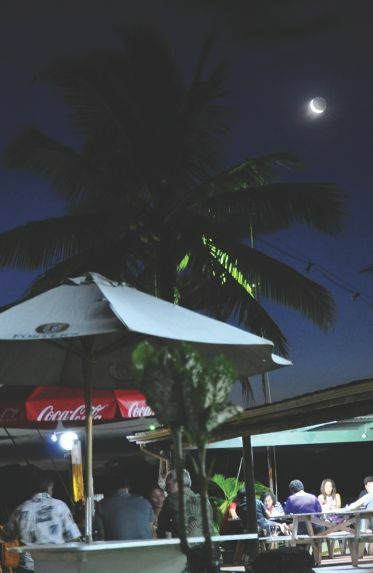 The lawn area offers a place to relax and enjoy the sunshine, sunset or cool tropical evenings outside of the bar and lounge areas. The lawn is also suited to a large number of people who wish to socialize casually. The club operates 7 days a week and is limited to the laws of the day. Happy hour is on Tuesday, Wednesday and Friday from 6pm to 7pm. During the day sensible casuals are permitted and from 1800 hours onwards, smart casuals (dress shoes, sandals, collard t-shirts and shirts) are required. The wearing of hats by males in the bar area is forbidden and the penalty for doing so is to buy a round of drinks for every patron in the bar at the time! The RSYC slipway caters for the smaller vessels up to 20 tons on the first cradle with arms that extend according to the needs of the vessel. The second cradle caters for vessels up to 10 tons but do not have the arms to support the vessel. If you have your own provisions for a trailer, arrangements for haul out are at your discretion. A crane that caters up to 4 tons is available for hire. This Boatshed & Marine Centre provides showers and toilets for members and yachtsmen/ yachtswomen as well as washtubs. 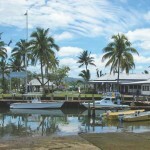 This also houses the Yacht Shop, Dive Center (commercial) and Suva SCUBA (recreational). 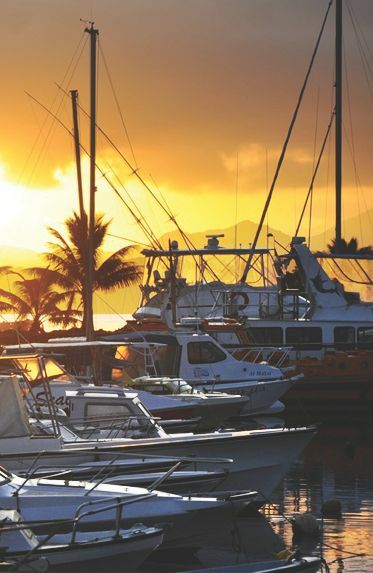 A loading & fuelling Dock is located in front of the TOTAL Bowser and accommodates fuelling for all registered and visiting sailing vessels to the club, loading and off loading of registered private sailing vessels only. Junior Sailing has been a very busy sport for the junior members of the club. 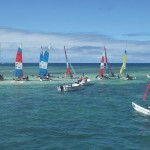 This activity is run on Saturdays and has very well established junior sailors within the club. B’Class Sailing have their competitions on Sundays. 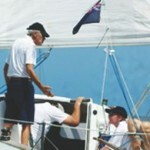 Don’t be fooled by their friendly banter as these sailors are very serious and very competitive in their sport. 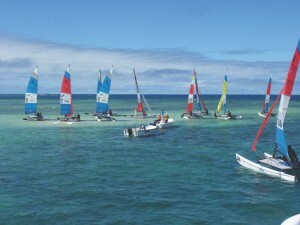 Hobie Cat Sailing has seen members represent the club and country nationally and internationally. Early mornings and late afternoons any day of the week, outrigger paddlers are seen leaving the club for training or competing in national competitions. 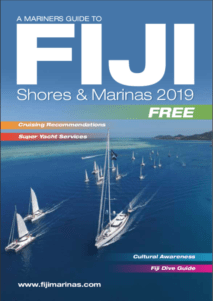 The RSYC International Game Fishing tournaments are held throughout the year offering prizes in various categories for catching the elusive Sailfish, Marlin, Wahoo, Yellow Fin Tuna or Walu. There has been an increase in the number of tournaments and the number of people competing. 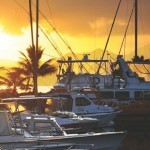 Just 5 minutes from the yacht club in the waterfront suburb of Lami, you will find the newly renovated 108 room Novotel. 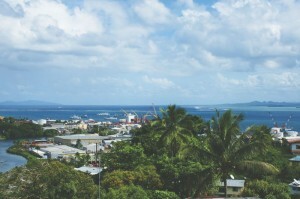 The Holiday Inn located in downtown Suva is just steps from the city’s key sights and also enjoys harbour views. The refurbished Tanoa Plaza is also centred around the mid city buzz! 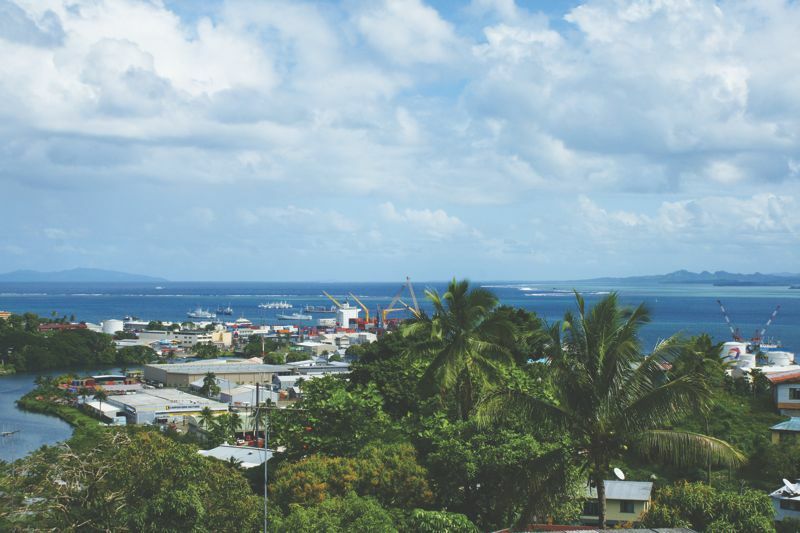 Lami and Suva City are both a short bus or taxi ride away. 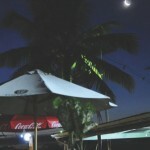 Once at the main Suva bus station, the country is yours for the exploring. 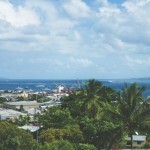 Regular buses depart in either direction around Viti Levu. Could you please email me back a price in FJD and availability. Thank you. Congratulating you on the accuracy of content of your website! Please be advised that your Life Member, Mr Richard M Warner (Number 2007) has died. Hi, last year I bought a diving torch (Atlantis L1-900) from you. I am planning to buy another diving torch, so could you please provide details of the available torch in stock to my gmail address ([email protected]).